June 20, 2018 – Cleveland, Ohio, USA – MB Dynamics, Inc. (www.mbdynamics.com), field-proven industry experts of nearly 80 years in the design, manufacture and supply of vibration test systems and equipment, including squeak and rattle test systems, steering test systems, suspension component test systems, modal exciters and amplifiers, automated calibration systems, dynamic controllers, transducer calibration systems, and engineering services, today announced its non-hydraulic Steering Module Test Simulator (SMTS). 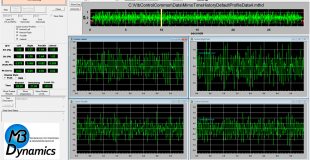 The SMTS is used by automotive, autonomous, construction and off-highway vehicle OEMs and their associated steering suppliers for accurate, reliable and repeatable in-laboratory simulations of driver, road and vehicle inputs and their associated effects on steering system performance and annoying noises. The test benches may be used to effectively detect the root causes of airborne and structure-borne noises, known as rack rattle, clatter, reversal clunk, zipper and running noises, in columns, gears, I-shafts, column EPS and rack EPS units. 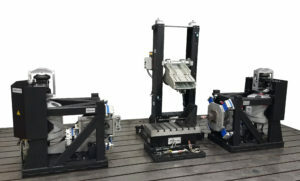 The non-hydraulic steering module test simulator may also be used to help meet both objective and subjective NVH performance metrics; accurately characterize steering system sensitivity and performance; experimentally verify EPS functions; and to achieve other steering system performance goals, over a vehicle’s full warrantied service life. 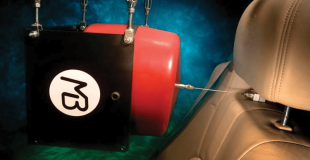 A typical non-hydraulic SMTS turnkey system from MB Dynamics may include an extremely electrically and acoustically quiet rack load simulator, capable of simulating tie rod forces to 25 kN, as well as strokes from 20 mm pk-pk to 250 mm pk-pk. Also available are acoustically and electrically quiet driver simulators for inputting and controlling steering wheel position, velocity and/or torque values to columns and I-shafts from 10 Nm to 150 Nm. Multiple onboard hardware and software features of the SMTS virtually eliminate the cogging, torque and force fluctuations associated with EPS motor pole-passing. 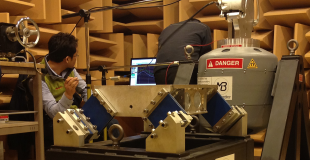 As a result, no new noises or dynamic disturbances are introduced into the test environment, and therefore no masking of the noises or NVH metrics under evaluation occurs. The incorporation of extremely quiet system components allows for greater ease of troubleshooting, identification, diagnosis, and resolution of the root causes of unwanted noise and other performance issues common to EPS, EPHS, EPAS, MDPS, and HPS steering systems. A series of PC-based dynamic controllers further incorporate supplied sensors and signal conditioning to acquire angle, displacement, force, acceleration, and torque parameters, as required for multi-axis closed-loop control. Additional options include gear fixtures, column stands, a compact mobile measurement system for Road Load Data Acquisition (RLDA); and an NVH test analysis system, for the recording and objective evaluations of noise and vibration parameters. ­ As a non-hydraulic system, the SMTS requires no oil for operation. Founded in 1939, the privately held, Cleveland, Ohio-based MB Dynamics has a nearly 80-year field proven history as a reliable total solutions provider for vibration test requirements. The company applies its vast wealth of experience in vibration testing and instrumentation to offer a truly one-of-a-kind innovative approach to customer problem-solving in automotive, aerospace, industrial, laboratory R&D, civil engineering, modal and structural testing, general test and measurement, academia, and other sectors. All solutions offered by MB Dynamics are accompanied by the necessary hardware and software to ensure seamless integration, along with the value-added benefits of full applications engineering support from one of the industry’s most experienced teams. This expertise is made available to MB Dynamics customers locally in more than a dozen countries. For more information about the Steering Module Test Simulator, or other products from MB Dynamics, please contact the company at +1-216-292-5850, via email at sales@mbdynamics.com, or visit www.mbdynamics.com.